WE’RE A CENTRAL FLORIDA COMMERCIAL, INDUSTRIAL, & VACANT LAND BROKERAGE FIRM. Hauger-Bunch, Inc. Realtors is a leading commercial, industrial and vacant land brokerage firm servicing Central Florida markets between Tampa and Orlando. Whether the needs are associated with acquiring, selling, leasing, or developing properties, or end-users undergoing site selection, our professional staff are prepared to assist with qualifications in the field of real estate brokerage, development and land planning. The staff holds certifications with the Society of Industrial and Office Realtors (SIOR) and the American Institute of Certified Planners (AICP), together with memberships in the National Association of Industrial and Office Properties (NAIOP), Greater Lakeland Chamber of Commerce, the Lakeland Economic Development Council, the Lakeland Association of Realtors, Florida Association of Realtors and the National Association of Realtors. Central Florida, the part of the State incorporating Tampa Bay and the Orlando area, spans an 85 mile range along the I-4 corridor. Known as the High-Tech Corridor, it connects major metropolitan regions supported by two international airports, major rail operations, Port Tampa Bay, along with State Universities, including the newest Florida Polytechnic University focused on medical, engineering, and robotics design/application. At its mid-point is the Lakeland/Polk County market, and Hauger-Bunch has the history and expertise to help guide your business through the market options. Recognizing early the potential of the I-4 corridor, the company’s principals developed the first Class A industrial park in the Polk County market at I-4 and County Line Road, now recognized nationally as a logistics hub. With 8.7 million people within 100 miles of this central Florida market, the area has established itself as an ideal distribution center, one that can provide same-day service to the full State, and as an area supportive of new business, residential development and support commercial, including an expanding tourist industry. mixed use & residential land listings. 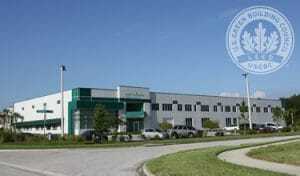 27,600SF LEEDS Certified Manufacturing Facility – SOLD! This is a Class A, purpose-built light manufacturing/assembly facility. LEEDS certified, it is energy efficient, with numerous manufacturing and administrative amenities. Like new condition. Located in a Class A restricted Corporate Park. One (1) mile to Lakeland Linder Regional Airport. 25,400 SF Fabricating Shop – SOLD!! 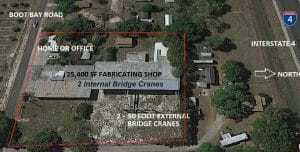 Strong industrial facility with capacity, height, and multiple bridge cranes (verify condition). Good ceiling height, ground level floors. Roof top sign could be visible from I-4. Direct access to I-4, 1.6 miles via Boot Bay Road. 1,700 SF home or office. Industrial zoning for ag-related manufacturing. Verify for other uses. Remote site for I-4 signage. Technology, Warehousing, Distribution, & a thriving arts & culture atmosphere. 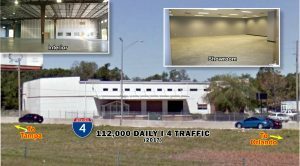 The I-4 corridor is the rapidly expanding high-tech connector serving both the Orlando and Tampa markets. Due to its strategic market position, this Central Florida area supports significant logistics, supply chain and warehousing/distribution opportunities. But it’s not just about logistics. The area is also rich in higher education institutions, health care facilities, art museums and cultural events. All of this, combined with a mild, sunny climate, creates a true Quality of Life. Located along I-4 between Tamp and Orlando, Lakeland has a population of just 100,000, and the city limits cover 74.4 square miles. It is home to Florida Polytechnic University, Southeastern University, Polk State College’s Lakeland Campus, and Florida Southern College which hosts the largest on-site collection of Frank Lloyd Wright architecture. The RP Funding Center, Polk Museum of Art, Lake Mirror Park, and Hollis Garden, along with annual events such as the SUN’n FUN International Fly-In & Expo, MidFlorida Mayfaire by the Lake art show and the Lake Mirror Classic Auto Show, are all part of Lakeland’s vibrant downtown and community. The new 200-acre Bonnet Springs Park will further enhance the downtown area with its tentative opening in 2020. Lakeland is the corporate home to Publix Supermarkets, as well as housing regional hubs or distribution/fulfillment centers for GEICO Insurance, Amazon, Rooms to Go, Well Dyne, Southern Wine & Spirits, Lockheed Martin, Saddle Creek Logistics, FEDEX Corporate Services and many others. Polk County is the geographical center of the state of Florida and covers over 2,010 square miles of area. Supporting a business-friendly tax environment, backed by high-skills workforce training and strategic location and infrastructure, Polk County is welcoming to innovative companies. Polk County is host to such businesses as Legoland, and a growing sports industry, including the new USA Training Center and Water Sports Complex for wake boarding and water skiing, and high-tech companies such as Protected Trust (cloud-based data protection), along with more traditional industries such as citrus, and phosphate. The diverse economy, educational resources, and strategic location make Polk County an ideal location for new business. © 2018 Hauger-Bunch, Inc. All Rights Reserved. Information concerning these offerings are from sources deemed reliable, but no warranty is made as to the accuracy thereof. It is submitted subject to errors, omission, change of price or other conditions, prior to sale or lease or withdrawal without notice.